Action movie star and former ‘governator’ of California, Arnold Schwarzenegger, has been made an ambassador for the French region by Le Grand Conseil des Vins de Bordeaux. 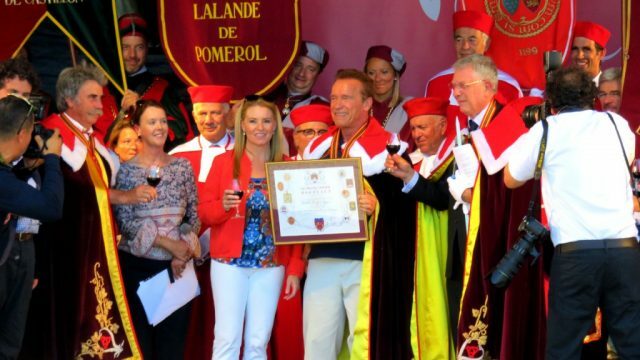 The Hollywood legend was invested with the cape and cap of the order and declared an ‘Ambassadeur d’honneur des vins de Bordeaux’ during the Fête le Vin in Libourne last Sunday. Le Grand Conseil, as with other wine fraternities, welcomes many people into its ranks each year. An ‘ambassadeur d’honneur’ is one step below the more “active” title of ‘Conseiller du Vin de Bordeaux aux Maîtres des Commanderies‘, which can be bestowed and is granted to those, “whose functions and renown can serve the cause of Bordeaux wines”. According to regional paper Sud-Ouest, Schwarzenegger met the mayor of Libourne, Philippe Buisson, this April when the Terminator star was awarded the Légion d’Honneur by out-going president, François Hollande. Buisson invited Schwarzenegger to Libourne for the festival and the actor promised to attend and did, apparently not entirely aware of what was in-store for him. Conveniently, Schwarzenegger was already in France in order to meet with president Emmanuel Macron to discuss climate change and the need for clean energy, in his capacity as president of the non-governmental organisation R20, which seek to advise governments on ways to reduce their carbon emissions.